On Monday, November 30, the Buzz Bros Band once again gathers at Schiphol for a journey to the Far East. Malaysia, to be precise. The quartet – Marnix, Berthil, Frans, and Chris – is joined by manager Natasha Gerold, and Berthil’s wife, Monika Haas. The couple will enjoy a holiday week in Malaysia after the tour. Malaysian Airlines’ great onboard service makes eleven hours of flying quite doable. The plane lands at 7:00 am the next morning, and a one hour taxi drive takes us the Pacific Regency Hotel, downtown Kuala Lumpur. We’re glad that everything has been properly arranged, so we can head to our rooms straight away and get some sleep. In the early evening we leave the hotel to find a place to eat, and we end up in a cluttered, busy little street where we have dinner under a large umbrella – and we really do need that kind of protection. It’s the rain season, obviously… The food is great, however, and the prices are incredibly low, compared to Dutch standards. Our first show is on December 2, for the Dutch Embassy. A premiere for the ambassador Paul Bekkers who has taken perfect care of everything required – and it pays off: it’s a great night, both for him and for us. There are more people that he had expected, and the music is highly appreciated. Our only problem is to control the sound in this room, which has a lot more reverb that we would have hoped for. But as always, these kind of problems seem to bother the musicians more than they do the audience. Frans plays a double bass rented by the Embassy. He really likes the instrument and he’d love to use it throughout the tour. This makes the rental company raise the price considerably. The negotiation process that follows is kind of awkward, and we’re very happy that the ambassador comes to rescue by offering us to pay for the instrument. The band simply sounds a lot better with Frans on double bass, rather than using the electric bass guitar he has taken along for emergencies. 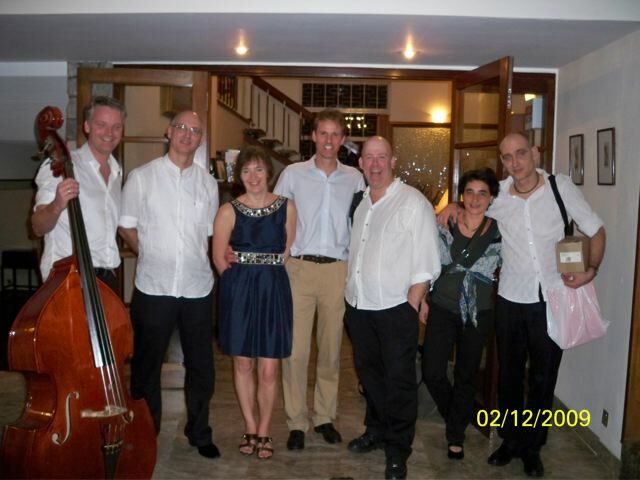 Tuesday and Friday, December 3 and 4, the band plays the Groove Junction, a nice jazz club in Kuala Lumpur. The first gig is an extra show, organized because the original gig for that night had been canceled last minute. As a result, there are not too many people around. The audience on the second day fully compensates for the quiet first night, however. Our sound check, in the afternoon, tells us that we’re going to play a great sounding room. When we get back to the club later that day, we’re shocked by the crowd that we find on the premises. It’s a large group of company employees that have chosen the club to celebrate some kind of anniversary, and they make a hell of a lot of noise. If they’re there tonight as well, we’re in for a treat… Fortunately, the team decides to continue their party someplace else minutes before we’re supposed to go onstage. Everybody welcomes the sudden peace and calm, so we decide to start playing just a little later than planned. The main performance for this tour is on December 5, at the Penang Island Jazz Festival, the largest Malaysian festival of its kind, and we’re the first Dutch band that has been invited to play there. It’s a hectic day. We have to get up really early, check out, get to the airport, fly to Penang and get a taxi for another 90 minute drive. The festival takes place in and around a large hotel compound with an impressive open air stage that looks into an idyllic lawn with palm trees, offering plenty of space for the audience. We can do our sound check the minute we arrive. Again, things have been very well-organized, and the sound techs do a perfect job. The band sounds great in very little time, and we’re anxious to start playing. The next day, we all go our own way. Berthil and his wife travel to their holiday resort, Marnix gets back to Kuala Lumpur, and the others stay in Penang for the day. On Monday Frans, Chris, and Natasha go the Kuala Lumpur Airport, where their night flight to Amsterdam keeps them waiting for hours on end. We’re back at Schiphol on December 8, after seven tiresome but mostly inspiring days.